« Lacquer the Cigar Box Guitar. 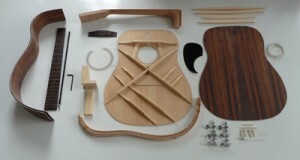 Based on the Martin Dreadnought pattern the scale length is 650mm and the neck has 14 frets to the body. Rosewood or Mahogany veneered back and sides and spruce veneered top. Mahogany neck. This high quality kit contains pre machined parts ready for you to assemble. Tonetech have written a comprehensive set of instructions by making up a kit and photographing the actual parts and assembly stages. There’s a section on making a workboard, mold and cam clamp. In addition to the kit we’ve added a bottle of glue, a btin Instrument Lacquer, and a range of sand papers.